Paladins update for PS4 and Xbox One is now available for download. The latest Open Beta 58 update brings new features and bug fixes. With the latest update, in the Competitive Queue player will have an additional 15 seconds to pick a character. Also, the latest patch has added a new flow for opening Radiant Chests in place of the Enchant Key button when selecting Open Chest. In addition, the developers have introduced a brand new VIP system with this update. Players will earn points to unlock VIP exclusive content by playing games, completing daily quests, and selecting winners for Paladins esports matches.Read full details below. Before a match you will notice something different! For the first spawn room phase of a game you will now be able to control and navigate your character in third person! In the Competitive Queue player will have an additional 15 seconds to pick a character. Added a new flow for opening Radiant Chests in place of the Enchant Key button when selecting Open Chest. Muting a player will now also mute their VGS. Corner damage VFX will now better correspond to where the player is being hit from. Paladins update for PS4 and Xbox One has added incoming damage indicators around the crosshair. Defaults to the left of the crosshair, can be set to above the player health bar. Incoming heal numbers will now change color to indicate that the healing was reduced by healing reduction. Friendly health bars will appear yellow-green when that player is under the effect of healing reduction. Aim Acceleration has been renamed to Turn Acceleration. With this patch, we are introducing the brand new VIP system! 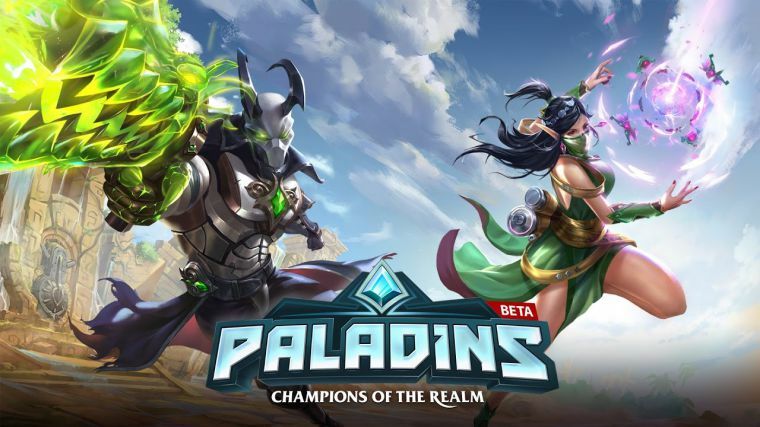 Players will earn points to unlock VIP exclusive content by playing games, completing daily quests, and selecting winners for Paladins esports matches. Players wanting to access this content faster can purchase VIP Membership or the VIP pack. Over the course of future patches, we’ll be adding more and more content to the VIP store. Every Patch we will release new exclusive content for the VIP store and/or rotate in previously available non-VIP content that will be available at a discount using VIP points. Every game of Paladins you play will now earn you VIP Points. Stay in touch with our Esports scene (coming later this fall) and correctly guess the winners of our upcoming matches for additional VIP Points. 50 Points per correct guess. Complete your weekly quests for even more VIP Points. 100 Points per weekly quest completed. +100 Points per win (in addition to normal 50 points). +35 Points per loss (in addition to normal 25 points). +100 Points per correct esports pick (in addition to normal 50 points). +400 points per weekly quest (in addition to normal 100 points). New visual update to the Champion’s base model. Check your game update and download latest Paladins Open Beta 58 update for PS4 and Xbox One.